Before the arrival of the Internet data networks were highly fragmented. Communicating data across companies, especially on an international scale, was relatively costly, slow, and hampered by capacity limitations. Then came the information superhighway; a metaphor taken from the transportation space. The digital highway swept away these barriers by providing a standardized pathway for data transmissions that encircled the world. With a modest investment in equipment, any organization could join the highway. The speed and volume of data flows grew exponentially, as did the rate of innovation in data communications. The Physical Internet is a “superhighway” for the movement and storage of physical objects. It was originally proposed in 2011 by Benoit Montreuil, currently the Coca-Cola Material Handling& Distribution Chair and Professor, Georgia Tech in the U.S. Since then the idea has gained many proponents, and the Fourth Physical Internet Conference will take place at Graz, Austria in July 2017. Hundreds of people from across the globe representing many industries are expected to attend the event. In Europe, the Alliance for Logistics Innovation through Collaboration (ALICE), launched by the European Commission in 2013, has adopted the concept and is working towards a real-world Physical Internet by 2050. 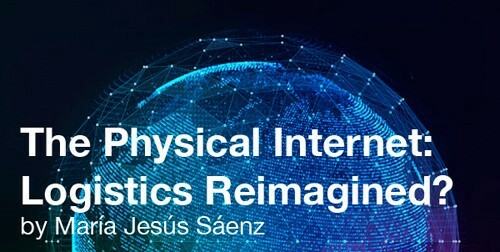 Note: This post on the Physical Internet Initiative by Maria Jesus Saenz is an extract of a longer article originally published by the Zaragoza Logistics Center. It is reprinted with permission.